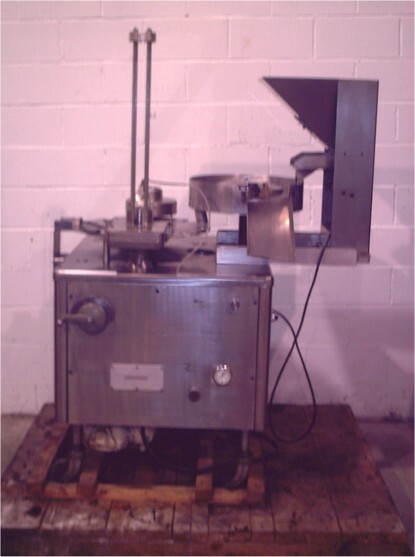 Rebuilt Custom Made Cup Filler for Gumballs or Individual Solid Products. Features: Stainless Steel Service Engineering Parts Handling System Model 1151, 115V, 1.2 amps. Gumballs were fed into a 6 station rotary feeder which dropped the gumballs into a cup. As the table rotated, the cup would be filled and sealed with a snap on cap and then discharged. Capable of filling up to 40 per minute depending on product and size. The entire machine is constructed in Stainless Steel and comes with a 3Ph/60Hz/220V variable speed drive. 8 Rotary Stations with 2” diameter dies. Last filling 1 gumball into a small Dixie cup. Overall dimensions: 46” x 32” x 62” high. Delivery Timeframe: Immediate.